The Nikkor AF-S 58mm f1.4G is a high-end prime lens with a bright aperture and a slightly longer than standard focal length. Nikon isn't short of 50mm primes, but only the 58mm in the current lineup carries the gold-ring denoting its professional status. Paying homage to the legendary Noct-NIKKOR lens, the 58mm is also designed to perform best at its maximum aperture. 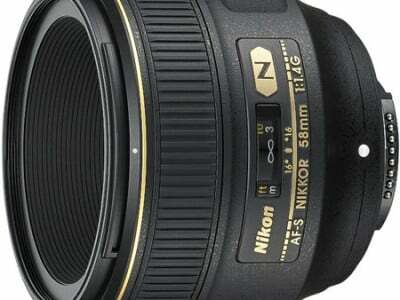 Check prices on the Nikon 58mm f1.4G at Amazon, B&H, Adorama, or Wex. Alternatively get yourself a copy of my In Camera book or treat me to a coffee! Thanks! The Nikkor 58mm f1.4G lens fills the last gap in Nikon’s line-up of professional grade f1.4 aperture primes that up-to now came in 24mm, 35mm, and 85mm focal lengths. What about the 50mm f1.4G I hear you cry? That earlier model, while certainly good, does not carry the gold ring designating Nikon’s highest grade and its performance does not reach that of the other f1.4 primes. So with its proud gold ring, the newer 58mm f1.4G occupies the position of the highest grade Nikkor lens with a standard focal length. Announced in October 2013 the AF-S 58mm f1.4G lens has a surprisingly long focal length which makes it the equivalent of an 87mm lens on a DX-body. It is the same length as the fabled 58mm f1.2 Noct-Nikkor that is no longer available new but still enjoys a strong following. Compared to other “normal” lenses the 16 percent longer focal length gives a slightly better background isolation and larger blur-circles for distant background subjects. In my Nikon 58mm f1.4G review I’ll present my findings from testing this lens on a 36MP Nikon D800 body over an extended period of four weeks. Most features are compared to Nikon’s AF-S 50/1.4G. The score in the “features-department” is 1[-]/8/4[+]. On paper the lens looks pretty average. Its only fault feature-wise is the steep price that makes one perhaps think of getting the very good Nikon AF-S 85/1.4G instead. See my Nikon AF-S 85/1.4G review. So the big question is: what improvement in optical performance do you really get that justifies the high price. 58mm is a seldom used focal length. On one side it is close enough to what is considered a “normal”-lens on a full-frame camera-body. Lenses are called “normal” when their focal length is close to the diagonal of the sensor (43mm for a FX-sensor). These lenses produce a life-like perspective and natural look when the images are also viewed from a distance that is equivalent to the diagonal of the print/monitor. A 58mm focal length is 35 percent longer than “normal” so you get a little more reach and can capture your subject from a slightly larger distance. But mind you it is not long enough for a flattering perspective in tight head-shots on an FX body. Framing a 60 x 40 cm portrait requires you to go as close as 1m which is generally considered too close. For that type of shot you’d better get an 85mm lens for your FX body. Of course when you mount it on a DX body it delivers a much more portrait-friendly 87mm equivalent, but again you’d have to ask yourself what it would offer you over the 50mm f1.4G at a much lower price. On the other hand you might want to choose only one top-end f1.4 lens for your work. In this case the 58mm sits nicely between the 35mm and 85mm alternatives that might give you either too wide or too close crops of the scenes you’d like to capture. It certainly eliminates a lot of switching back-and-forth that could occur with a 35mm + 85mm set-up and thus gives you more time to concentrate on capturing the moment. – Nikon’s own AF-S 50/1.4G and Sigma’s AF 50/1.4 EX DG HSM. Both models are similarly priced at around 350 – 450 EUR. The Sigma earned a recommendation in my Sigma 50mm f1.4 review and the Nikon performs similarly (I’ll update my Nikon 50mm f1.4G review pretty soon with results from the D800). There’s also Nikon’s old AF 50/1.4D still on offer and it’s the cheapest of the bunch. But from what I’ve seen in other reviews the 50/1.4G seems the better choice. Plus Sigma announced a newly designed 50mm F1.4 DG HSM (more information here). – Then there are other alternatives if you can do with manually focusing the lens. But as the dof at f1.4 is pretty shallow make sure that your focusing capabilities are up to that challenge! If so you can choose from the Zeiss ZF.2 Planar T* 50/1.4 at 600 EUR and the Voigtlander SL II Nokton 58/1.4 at 500 EUR. Both lenses perform very well in the image center according to reviews but the Zeiss seems very soft in the FX-corners and the Voigtlander produces a nervous Bokeh. – And finally there’s the new Zeiss ZF.2 Otus 55/1.4. It also has no auto-focus but at a price of 3500 EUR and over 900g weight plus a completely different optical design than other “normal” lenses it sets a new benchmark on optical performance in this group. See my Zeiss Otus 55mm f1.4 review. Focus accuracy and repeatability is critical to consistently produce sharp shots, especially with large aperture primes. Repeatability (the accuracy of focus on the same subject after repeated focus-acquisition) of this lens is very good with only very slight variations and no real outlier over a series of 40 shots. And the lens focuses in around 0.8 sec from infinity to 60 cm, which is OK. The 50/1.4G does this in 0.7 sec. The focus ring has no slack/play between its movement and the focus-action and a throw of around 100 degrees, which is a little short for accurate focus wide open (the Nikon 50/1.4G turns 190 degrees). The focus ring is easy to grip and moves smoothly. AF-operation is barely audible from the outside. If you record video with the built-in microphone focus-movement starts and stops with almost no “clack” and the AF-drive itself is also not too annoying. Focus breathing is visible: things in the background become larger the closer you focus. But I’d rate the effect pretty harmless. The lens has a weather sealed metal lens-mount and nine rounded aperture blades. The outer barrel is plastic. After two weeks of testing I had produced kinks in the front-disk directly behind the filter-thread by simply re-attaching the lens-cap without caution. Other users complained as well. It’s the same sort of ring with the 50/1.4G and not surprisingly this lens showed the same signs of wear. It is a bit disappointing to see such a (cosmetic) weakness on an expensive lens like the 58/1.4G. Now it’s time to check out some results in my Nikon 58mm f1.4 quality and Nikon 58mm f1.4 sample images pages!